Rottweiler dna dog tests. make sure your rottweiler passes there dna genetics tests certification. Test your Rottweilers DNA. Within cells, DNA is organized into long structures called chromosomes. These chromosomes are duplicated before cells divide, in a process called DNA replication. Eukaryotic organisms (animals, plants , fungi , and protists) store most of their DNA inside the cell nucleus and some of their DNA in organelles, such as mitochondria or chloroplasts. In contrast, prokaryotes (bacteria and archaea) store their DNA only in the cytoplasm. Within the chromosomes, chromatin proteins such as histones compact and organize DNA. These compact structures guide the interactions between DNA and other proteins, helping control which parts of the DNA are transcribed. Below is the only two different types of DNA Profiles AKC has available. 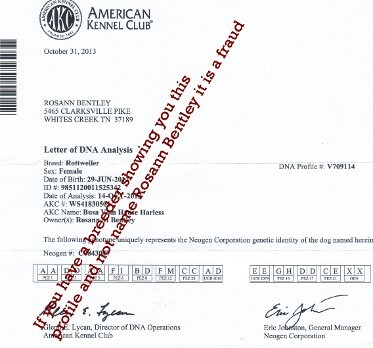 If your AKC DNA profile does not look like these it is fraud. Also note I have deleted in both pictures a piece of the letter profile to prevent fraud of sell puppies. 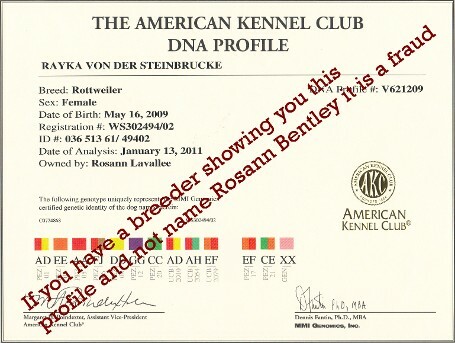 Contact AKC if there is any changes that look different, but as of 10-31-2013 I have not see the profiles different. The profile on the right is the origional and signed authentic profile. The one on the left is the paid authentic certificate (just a fancy one to look cool).